One year ago, a horror unfolded in a Mississippi Delta soybean field, when an East Coast Marine Corps Reserve KC−130T on its way to California went down. Fifteen Marines and one Navy corpsman perished that fateful day ― July 10, 2017. Now, their families are gathering in Itta Bena, Mississippi, about six miles from the crash site, to unveil a monument to the victims. The “Yanky 72” memorial is named after the aircraft’s call sign, Clifton Addison, a Marine Corps League member and memorial committee chairman who led an effort that raised more than $100,000 for the memorial, told Marine Corps Times. He and his team are expecting 200 people for Saturday’s ceremony, which also will be streamed live. A dedication ceremony at Mississippi Valley State University will be called to order by Sergeant Major of the Marine Corps Ronald L. Green. 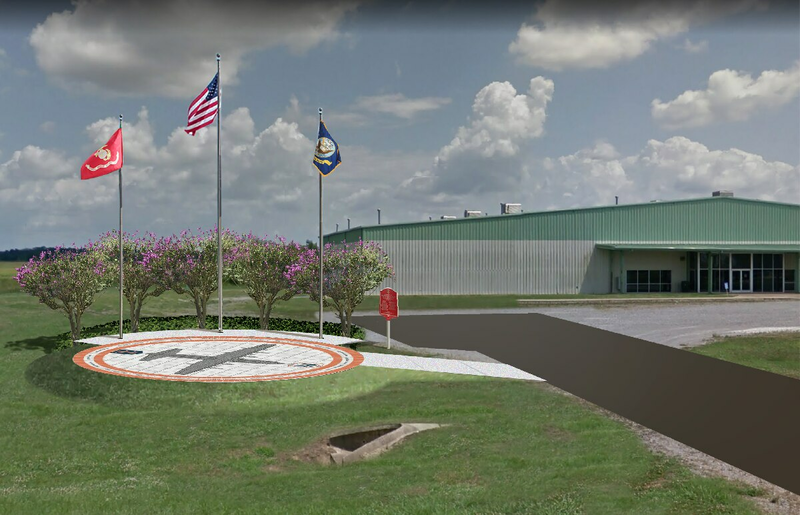 Lt. Gen. Carl E. Mundy III, the leader of Marine Corps Forces Special Operations Command, Lt. Gen Rex McMillian, commander of Marine Corps Forces Reserve, and Sen. Cindy Hyde-Smith , R-Miss., will also be in attendance. The memorial will have a 30-foot base, with the aircraft orientated toward the last known heading of the Yanky 72, Addison said. An outer ring includes the names of the fallen service members in brass letters. Seven of the troops were with Marine Corps Forces Special Operations Command 2d Raider Battalion. They were traveling for predeployment training in Arizona. The rest belonged to the reserve unit Marine Aerial Refueling Squadron 452 out of Newburgh, New York. 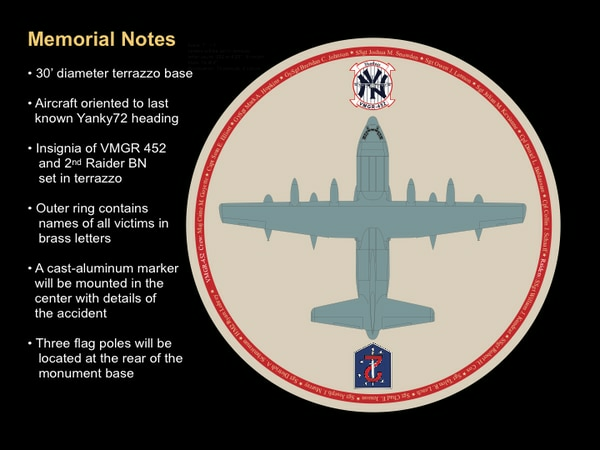 VMGR−452 and 2d Raider Battalion’s insignia are included on the memorial as well, according to Addison. In April, Mississippi Gov. Phil Bryant signed Senate Bill 2458 that renamed a portion of U.S. Highway 82 in Leflore County, which ran through the crash site, YANKY 72 Memorial Highway. The cause of the accident has still not been released. Andrea Scott is managing editor of Marine Corps Times. On Twitter: _andreascott.